Your skin is a living organism and demands dedicated care to keep it looking good and performing optimally. You need to look after it if you want good, healthy skin into old age. Exercise - Exercise has a direct and indirect cleansing effect on your skin and body. The skin clears some of the waste and impurities from your metabolism through regular, healthy perspiration. The increased circulation in the skin helps to oxygenate your skin and ensures a better supply of nutrients. The most effective way of ridding your body of damaging hormones is through daily exercise. Regular exercise also reduces the products of stress, such as adrenaline, which build up and affect the skin negatively. A calm person tends to have calm skin. Healthy Food - Your skin reflects what you eat. Foods that nourish, protect and revitalise your skin include fresh vegetable juices, seeds and sprouts, fatty fish (such as salmon), blueberries, cherries, red grapes, yoghurt, garlic, olive oil and wheatgrass. Eat your antioxidants - they protect your skin from damage inflicted by free radicals (unstable oxygen molecules produced by pollution, sunlight and cigarette smoke). Hydration - Water hydrates and cleanses from the inside. Your skin is your largest organ of elimination. Drink at least two litres of water a day. Sleep - Good sleep is an essential part of wellbeing, including good skin. Night time really should be about refreshing and regenerating. When you are asleep, new skin cells are generated and there's increased blood flow and nourishment to the skin's surface. 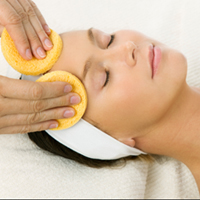 Being tired slows circulation, diminishing the skin's sheen. Make it a priority to get at least eight hours sleep a night, and apply a night cream packed with antioxidants and other nutrients to replenish the skin. Vitamins - The epidermis has no direct blood supply, so nutrients and oxygen from the deeper dermis, which has an excellent blood supply, have to pass through several barriers to get to the cells on the outside. It's therefore a good idea to feed the epidermal cells by applying vitamins to the outside layer of your skin.